So after the Madonna learns to slackline picture having so much publicity lately, I thought I would show you how I taught the guy that teaches Madonna’s personal trainer how to do Yoga. 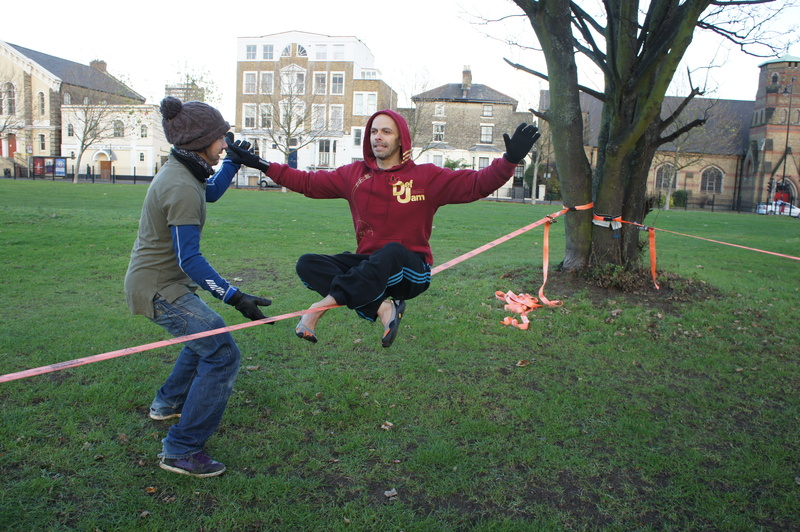 My client for this private lesson was Thierry Giunta, a top yoga teacher from London whose 10+ years of exercise industry experience would really put my slackline knowledge to the test. I brought in my friend and experienced slackliner Chill with me to help out. We started the lesson answering a couple of questions Thierry had, such as: ‘Is there a possibility of hurting myself?’ and ‘What skills can I expect to possess by the end of our session?’ which were great questions to ask. We assured him that he would sustain no injuries under our supervision, and we ran through a quick lesson plan for him so he could see what fun lay ahead! We then proceeded with a warm-up, our aim being to get Thierry to break a sweat before even making contact with the line. 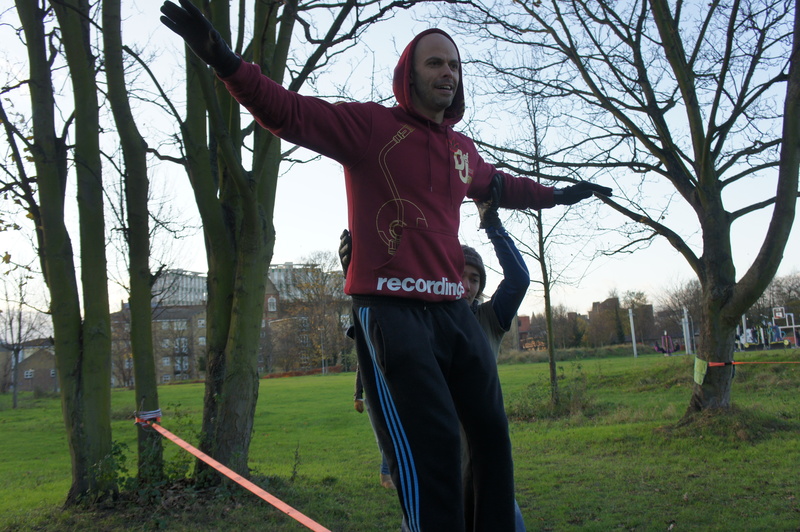 Our warm-up lasts for about fifteen minutes but includes such a variety of solo and partner-based balancing drills, that you’re already using the sports-specific muscle groups that you would use on the slackline, before you’re even on it! Thierry could see straight away from our drills that getting on the line and staying balanced would take a solid amount of concentration. Needless to say, his yoga background helped him immensely with the drills. After the ground-based drills were complete, we took Thierry on to the line, to teach him the principles of balancing. Just balancing. We teach this first, as walking is made up of balancing on each leg. We made sure to change sides often, to prevent fatigue and to also train both sides as evenly as possible, as it is usual that one side is stronger and favoured more than another. Fortunately, Thierry had been working on strengthening his weaker side, and so he had good stamina in both legs. We appreciated that it was a lot of information to take in, but Thierry took our instructions on board right away, and within minutes, results were visible. ‘Is it normal for the line to wobble so much?’ Thierry asked. We assured him that everyone’s first time brings on the ‘wobbles’, but with a couple of hints and tips, Thierry had stopped the line from shaking. Both Chill and I were very impressed. We explained to Thierry that on average, a student can expect to be able to balance solo – on either leg for at least one minute – after 2 -4 hours of practice. We only had an hour to work with, so after we were happy with Thierry’s balancing skills, we progressed to teaching him to walk. Thierry was up to scratch by now with the amount of time it would take him to balance solo. Fortunately, this was a private lesson, so he had Chill and I on hand to help him as much as he needed. We did, however, try to push him as much as we thought he was able to handle, by encouraging him to balance solo, little by little. We both helped Thierry to walk the line, explaining the various important principles and techniques that are required to walk from end to end, with the correct form, posture and muscle-engagement. We also showed Thierry the opposite, how to completely relax on the line whilst walking, and use the minimal amount of effort. After a few minutes of walking aided, we let Thierry control the amount of help he was given, by letting him choose when to walk aided or unaided. He kept his concentration up for the entire time and even managed to take the odd step here and there. We explained that for walking a line, solo – average 15m, end to end – one could expect to put in between 2-10 hours of practice, depending on sports background etc. I explained that for me, it took 3 days, 2 hours a day, to be able to take my first few steps, and about 10 hours total practice to walk a line, half-man (one way). 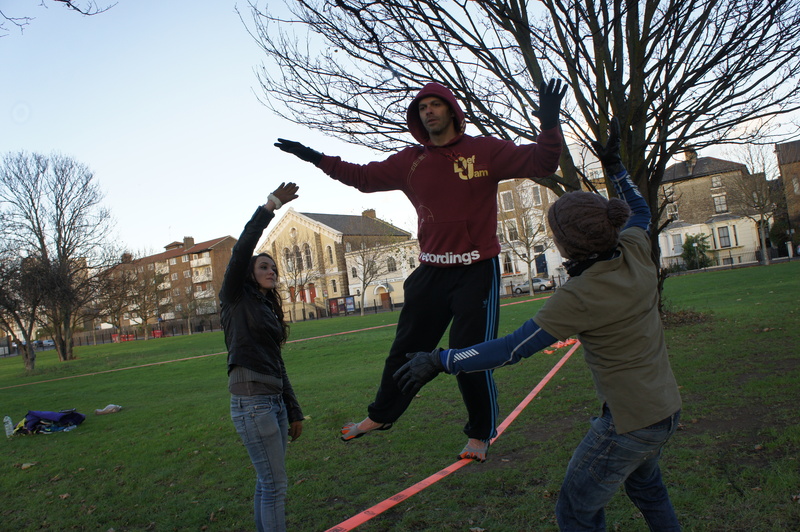 For the last part of the lesson, we took Thierry through a slackline workout, incorporating fairly intense callisthenics exercises, using the line. We chose harder exercises for Thierry, because we knew his physical condition would permit him to handle it! The beauty of working out on a slackline is that there are beginner, intermediate or advanced options for any exercise, depending on your ability. After ten minutes of hard work, Thierry beamed a smile, as we warmed-down and chatted over a few more questions and points that he had. We thoroughly enjoyed teaching Thierry. He really set the example of a keen student, he listened to what advice we had to give and results started to shine immediately. 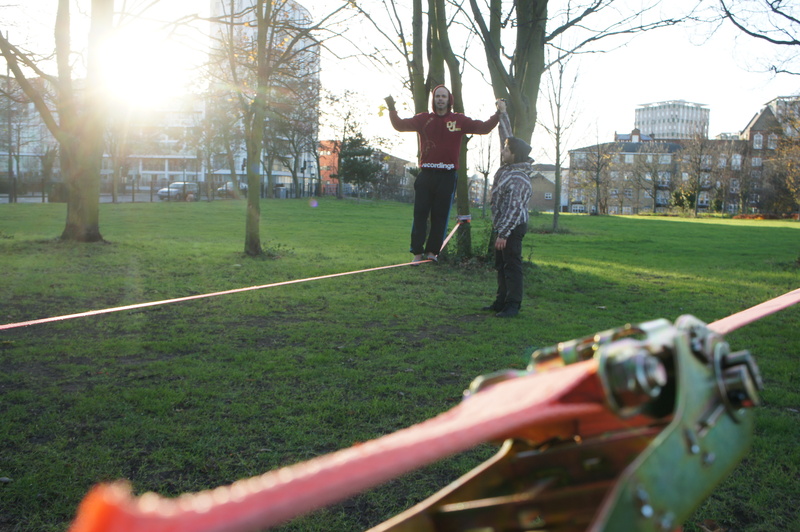 He encouraged us to carry on with our lessons and to let him know of future meet-ups and slackline jams in London, as he really enjoyed himself and wanted to practice as soon as the opportunity arose. All in all, it was a great effort from everyone, despite the finger-numbing cold temperatures. 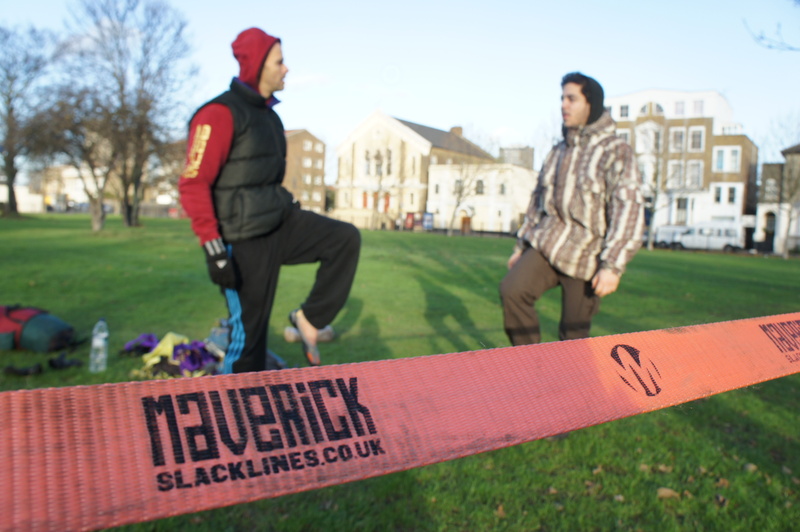 Thanks to Maverick for supplying the lines, to Thierry for stepping up to the mark, and to Chill for offering his slackline wisdom. Yoga teacher to celebrities, High achievers & Athletes. This entry was posted in Slacklining and tagged Garuda Pilates, harry cloudfoot, James D'Silva, madonna, maverick slacklines, Personal Trainer, private lesson, Progressive Yoga, slackline, slacklining, Thierry Giunta, Yoga by harrycloudfoot. Bookmark the permalink. Really good insight into what it takes to learn to walk the line! great result!